261 Sunday March 3rd 1889 It was quite a pleasant day. I worked all forenoon in the kitchen while Adda done the work up stairs. I spent the afternoon talking with the folks as they was all over and read in the evening. John Stevens here to dinner Monday March 4th 1889 It was a cold day but Adda washed and hung the clothes out. I done some practicing and a little knitting Will was around the place most of the day. But went to town in the evening. Adda and I caught the chickens tonight. I wrote to Ann Gilbert Tuesday March 5th 1889 Adda washed again today and hung the clothes out. I done some practicing and some knitting. In the afternoon Adda gave the summer kitchen a good cleaning up Adda churned too in the afternoon. I practiced some. Wednesday March 6th 1889 Adda ironed in the forenoon after she got her work done up stairs. I practiced some. Will went to a sale but came home soon after dinner and went to town to pay the taxes. Mother was over to put the plants out and sprinkle them. I wrote a letter to May. Minnie Lathrop called in the afternoon. Will was to town in the eve and I practiced. 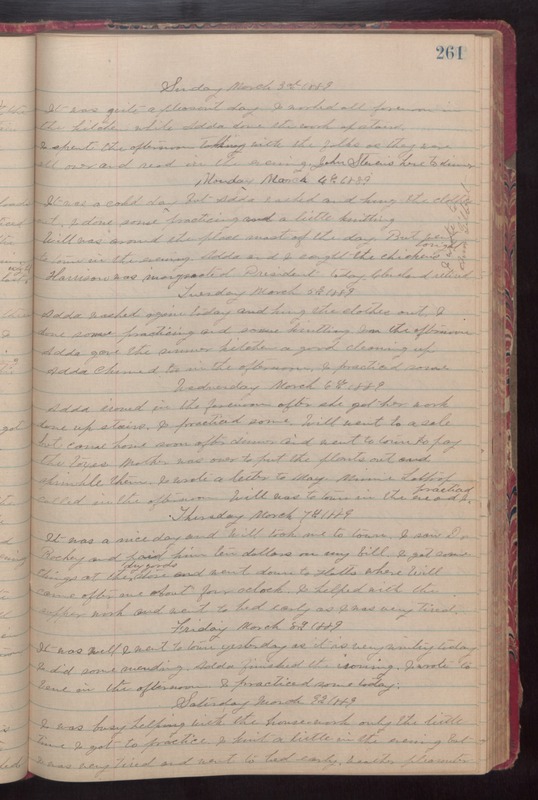 Thursday March 7th 1889 It was a nice day and will took me to town. I saw Don Rockey and paid him ten dollars on my bill. I got some things at the day goods store and went down to Hatts where Will came after me about four oclock. I helped with the supper work and went to bed early as I was very tired. Friday March 8th 1889 It was well I went to town yesterday as it is very wintry today I did some mending. Adda finished the ironing. I wrote to Vene in the afternoon. I practiced some today. Saturday March 9th 1889 I was busy helping with the house-work only the little time I got to practice. I knit a little in the evening but I was very tired and went to bed early. Weather pleasanter.